THIS Day of Reckoning has already arrived! Anyone who thinks financial Armageddon is far off into the future had better wake up and smell the smoke. Right now, at least three big fires are burning in Europe, and any one of them could shatter the fragile European Union. Turkey is not a member of the EU, but it’s a close partner via the EU-Turkey Customs Union and a big debtor to EU banks. An implosion of its economy will hit the EU hard, and that implosion is already underway. Last year, the value of the Turkish lira plunged 45% in just eight months. Suddenly, all imported goods cost nearly double, and consumer price inflation went berserk — surging 25% compared to the prior year. In response, President Tayyip Recep Erdoğan jacked up the country’s average interest rates to 35%, imposed draconian price controls, set off a chain reaction of corporate bankruptcies, drove the non-farm jobless rate to over 14%, and precipitated a 10% crash in industrial production. Now, he faces the same choices we’ve seen in countless bankrupt countries before: Cut interest rates and let the currency collapse … or keep rates high and let the economy collapse. Either way, the end game is the same: Turkey is going down, and it’s going to default on its massive debts to the EU. The Greek debt crisis is no longer in the headlines. But that doesn’t mean Greece’s bad debts have magically disappeared. Its banks are still swimming in $100 billion in nonperforming loans, with the largest institutions in the deepest cesspools — the National Bank of Greece has $18.4 billion; Eurobank, $19.5 billion; Alpha Bank, $27.8 billion; and Piraeus Bank, $32.2 billion. 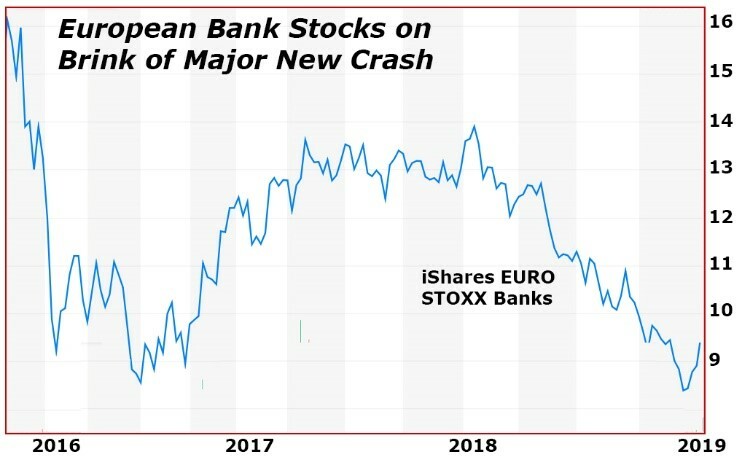 No wonder Greek bank stocks plunged 50% last year! As I showed you last week, Germany’s largest bank — Deutsche Bank — is the canary in the coal mine of Europe. Nearly 12 years ago, on May 23, 2007, its share price reached a high of $150.52. Now, even after a minor rally, it’s trading at $9.29. Italy is officially in recession and its debt crisis has returned in full force. Anti-EU protests are intensifying in France, Hungary and Serbia. They’re also bound to get a lot worse in Italy and Germany. In May, the European Parliament will hold elections. Anti-EU parties are expected to gain control or near control, empowering them to elect the next members of the powerful European Commission (EC) — not to mention the European Central Bank. And don’t forget: The UK is still scheduled to withdraw from the European Union (EU) on March 29, deal or no deal. Even if it’s postponed, it will just prolong the agony. Right now, all of this turmoil in Europe — plus fears of much worse to come — is driving flight capital into U.S. markets. And that’s one of the main reasons the Dow has been so strong this year. But don’t count on that lasting forever. In the next phase of this unfolding crisis, the U.S. will face its own financial judgment day.